Did You have a Sock Monkey Doll? I never had a sock monkey doll as a child, but I always wanted one. Many of my cousins had them, though, and I played with them every chance I had. There is something about a soft, cuddly, smiling, stuffed monkey that makes you want to hold it and play with it. These days, there is a large selection of sock monkey dolls available. They look good in colors other than the traditional brown or grey, too! There are those like Hobart that have magnets sewn inside the feet and hands to make it possible for them to hold hands with other sock monkeys. WARNING: If the magnets were cut or torn out of the monkey's hands or feet, they could be a swallowing hazard. Swallowed magnets can cause serious medical complications. Please be aware and supervise small children when they play with magnetic toys. My family loves to go to commission auctions looking for unusual treasures. I have seen some great buys of vintage items at these auctions, but as yet have not seen a vintage sock monkey that wasn't loved all to pieces. Hopefully, I will find one in good shape someday. Dolls of all sorts come through auctions on a regular basis. If you are a doll collector, consider checking out the auctions in your area. Any child would love to have this wonderful sock monkey family. With Mr. Coconuts, his wife, Cupcake, and their two children, Daisy May, and Joey, the fun possibilities are almost endless! 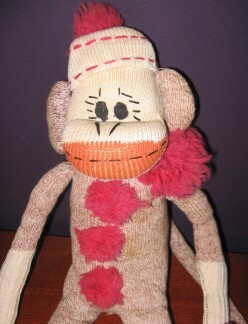 Mr. Coconut is 18 inches tall (when wearing his hat), and is made from the classic brown sock monkey sock. Also made from the classic brown sock monkey sock, Cupcake is 18 inches tall and wears a white hat with pink bow. Daisy May is 6.5 inches tall. Made from a pink and fuchsia-striped sock sock, she wears a hat and bow like her mother's. Joey is also 6.5 inches tall. Made from a brown sock, he wears a blue and red hat. The monkeys come in a cardboard car with four cutout windows and pop out tires. Your child will enjoy hours fun of driving the monkey family to their destinations. Recommended for ages 3 and up. Added bonus: Playing with the box is expected! Make Your Own Sock Monkey Doll! These days, you can make your own sock monkey doll! For a traditional doll, use red heel socks to make your own sock monkeys. You can use other socks to make your sock animals, too. Almost any tube socks or knee socks can be used. There are so many cute socks available, that you can make a huge variety of sock creatures. 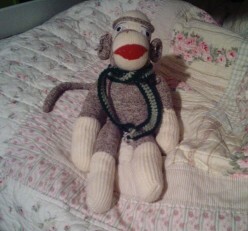 Sock Monkeys are Great Gifts! If you are looking for a great kids gift, you should consider a sock monkey doll. Whether you decide to purchase a new and jazzed up patterned and colorful sock monkey, such as the purple polka dot sock monkey, or the iconic original sock monkey shown at left in assorted colors, the child who receives it will love it! For an added bonus of joy, learn the sock monkey song from the Sock Monkey Music Video higher on this page and teach it to your child. Or just open up the computer and play the video for your child. Did you play with sock monkeys when you were a child?